Conasys, developers of a cloud-based platform designed to enhance homeowner care and communication initiatives for new home builders and developers, are pleased to announce a new partnership with Lanterra Developments. 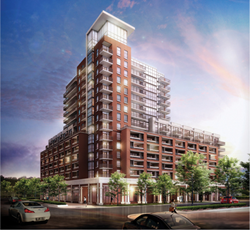 The move will make Conasys’ industry-leading platform available to residents of Treviso, an Italian-inspired 435-unit development located in one of the city’s most popular neighborhoods at Dufferin and Lawrence. We’re confident that making the Conasys platform available to Treviso Homeowners will reinforce our commitment to customer care, as well as our reputation as industry innovators. Lanterra Developments, a leader in the Canadian condominium industry, has been building award-winning communities in the GTA for over 12 years. Since the company’s inception, Lanterra has made its mark across Toronto’s skyline with landmark developments such as Maple Leaf Square and Ice Condominiums, as well as iconic luxury projects like One Bedford and Riverhouse at the Old Mill. As a rule, Lanterra only works with highly skilled and sought after architects and design firms, ensuring that every one of their coveted buildings is designed from the initial sales term to beyond the Occupancy period with complete homeowner satisfaction in mind. Accordingly, it is no surprise that Lanterra has decided to make the transition from extraordinary customer care to the industry-leading technology and responsiveness of the Conasys Homeowner Care Platform, which offers all homeowners 10 years of responsive, reliable and instant answers to inquiries about their suites through the Conasys homeowner portal, in conjunction with Lanterra’s ongoing commitment to customer service from both their on-site and head office customer care teams. Conasys’ interactive platform will allow Treviso homeowners to access a wealth of detailed information about their home, on-the-fly and from any connected device such as smart phone, tablet or desktop computer. To that end, each of Treviso’s 435 units will come equipped with a fully searchable portal, pre-populated with unit-specific information such as operating manuals, warranty information, building amenities and even paint codes. Furthermore, the platform will allow Lanterra to better converse with their customers through a suite of communication tools that includes Conasys’ recently enhanced Service Request Functionality.